GREG AMUNDSON: (Founder of Satvana Yoga and Chief Instructor) Greg is the owner and founder of CrossFit Amundson in Santa Cruz, Krav Maga Santa Cruz, and Satvana Yoga in Pleasure Point, California. Please see Greg’s full bio HERE. MARK DIVINE: (Founder of Kokoro Yoga – Kokoro Yoga Teacher Trainer) At 26, Mark Divine graduated as honor-man (#1 ranked trainee) of his SEAL BUD/s class number 170. Mark served for nine years on Active Duty and eleven as a Reserve SEAL, retiring as Commander in 2011. Mark is an accomplished martial artist with black belts in Seido and Goju Ryu Karate, a military hand to hand combat certification in SCARS and senior ranking in Saito Nijutsu. He is a Yoga teacher trained in Ashtanga Yoga, and is the founder of the Warrior Yoga program. After working with thousands of special operations candidates and professionals developing mental toughness, Mark self-published his first book Unbeatable Mind in 2011 and launched the at-home study program www.unbeatablemind.com. He is also the author of The Way of the SEAL, and 8 Weeks to SEALFIT. SEALFIT is uniquely effective at developing elite level physical fitness and mental toughness. The program has helped thousands to operate at an entirely new level in their personal and professional lives, and is used by military, first responders and sheepdog-like professionals of all stripes worldwide. Mark is a highly sought after speaker for corporations where his Unbeatable Mind program is helping to forge mental toughness among business leaders. He lives in Encinitas, CA., several blocks from the SEALFIT and Warrior Yoga Headquarters Training Center, the 20,000 square foot facility where he enjoys training with his family and team. ROLF GATES: (Founding Instructor and Yoga Teacher Trainer) Rolf is the author of the acclaimed book on yogic philosophy, Meditations from the Mat: Daily Reflections on the Path of Yoga, and the newly released: Meditations on Intention and Being: Daily Reflections on the Path of Yoga, Mindfulness and Compassion. Rolf conducts yoga workshops, retreats, teacher trainings, and coaching and mentorship programs throughout the U.S. and abroad and on his website. Rolf and his work have been featured in numerous media, including Yoga Journal, ORGINS, Natural Health, People Magazine, and Travel and Leisure’s 25 Top Yoga Studios in the World. Rolf is the co-founder of the Yoga, Meditation and Recovery Conference at the Esalen Institute in Big Sur, California and the Kripalu Center for Yoga and Health in Lenox, Massachusetts and a teacher at Spirit Rock Insight Meditation Center in Northern CA. He is also on the Advisory Board for the Yoga Service Council and the Veterans Yoga Project. A former addictions counselor and U.S. Army Airborne Ranger who has practiced meditation for over twenty-five years, Rolf brings his eclectic background to his practice and his teachings. Rolf and his wife, Mariam Gates, author of Good Night Yoga: A Pose by Pose Bedtime Story and Good Morning Yoga: A Pose by Pose Wake Up Story, live in Santa Cruz, California with their two children. Rolf is teaching a 500 Hour Advanced Yoga Teacher Training at Satvana Yoga beginning in October. To learn more and register CLICK HERE. CATHERINE DIVINE: (Kokoro Yoga Teacher Trainer) Catherine Divine is an experienced teacher and spiritual activist flowing with enthusiasm for the healing properties Yoga brings to each individual. In collaboration with Mark Divine, the founder of Warrior Yoga, Catherine is the head facilitator for Warrior Yoga Weekly Classes, Warrior Yoga Teacher Training Programs, and Warrior Yoga Retreats at the Warrior Yoga Headquarters facility in Encinitas, California. She is also co-author, along with Mark Divine, of the upcoming book “Warrior Yoga”. Catherine has trained in various styles under some of the best teachers internationally. Her training and experience makes for a class where students feel comfortable and safe. Her key focus as a teacher is to bring community together under the common thread of compassion and love. Catherine is a 500 Hour RYT Yoga Teacher Trainer and CrossFit Level I Instructor. 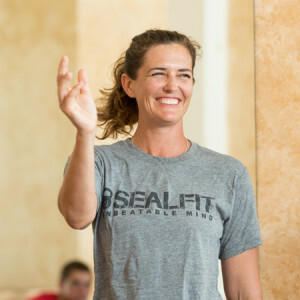 Catherine has also been instrumental in helping bring Warrior Yoga to the SEALFIT and Unbeatable Mind communities, and has helped hundreds of Special Operations candidates and Operators being a lifelong practice of Warrior Yoga. © 2019 Satvana Yoga. All rights reserved. Website design by Brooktown Design.